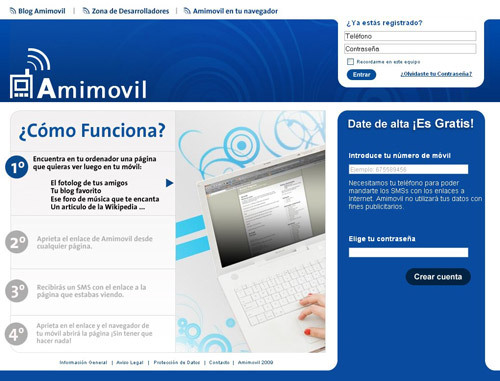 Looking to promote mobile data usage, Movistar entrusted Telefónica I+D to develop a simple web service that would allow users to transition easily between desktop and mobile web browsing. Movistar (leading mobile operator in Spain, part of Telefónica) was looking for ways to increase mobile data usage, and ease of transition in desktop-to-mobile web browsing was deemed as fundamental. 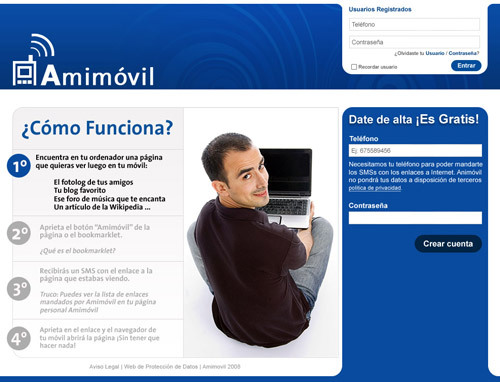 Movistar came to Telefónica I+D (R&D) with just a simple idea; a service that would allow users sending the URL of a webpage to their mobile phones. 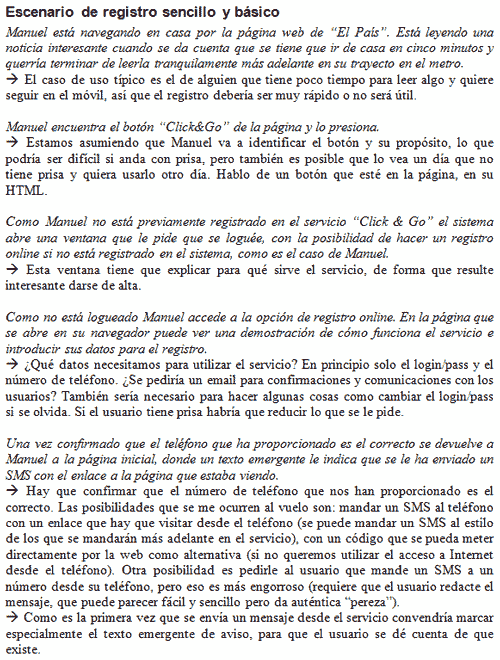 Movistar gave us a lot of freedom in defining the details of this service. Our main principle for the service was simplicity. The service completed an easy task, so it should complete it efficiently and painlessly. We went from the idea to a scenario, where we documented the interaction between a user and the service in real life, extracting guidelines for the implementation from it. 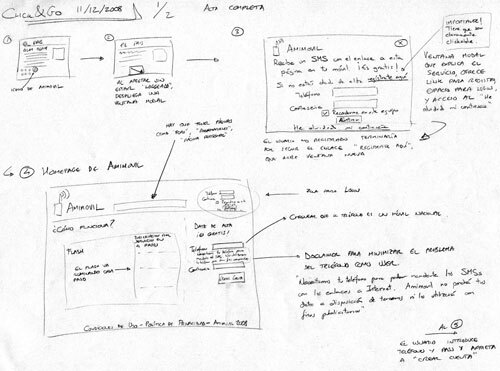 After selecting the main tasks, annotated wireframes (mostly hand-drawn, with some electronic ones for particularly critical pages) defining them were created and shared with Visual Design and Development teams, so they could proceed in parallel. While Development was building the functionalities, Visual Design translated wireframes to pixel-perfect mock-ups so that Development could pick required graphic assets afterwards. 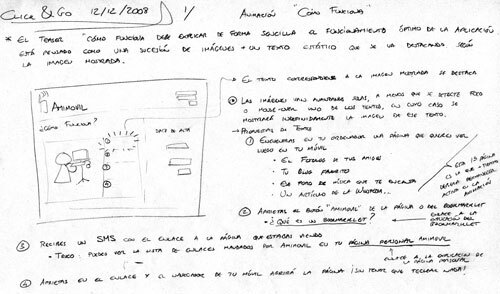 When a first prototype was created, some guerrilla usability tests were conducted to get feedback about the service. Proposed changes were shared in the form of annotated screen captures, and soon the final implementation was ready. The result was a simple to use service, where customer could sign up and start using the service in mere seconds. Assisted project management, making sure project kept flowing and team stayed connected. Created simple text scenarios for the main tasks based on the starting idea. 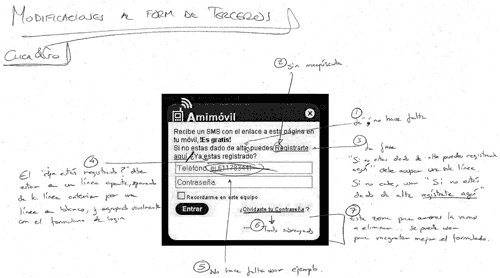 Defined flows for the main tasks based on the scenarios, illustrating requirements with hand-drawn annotated wireframes. 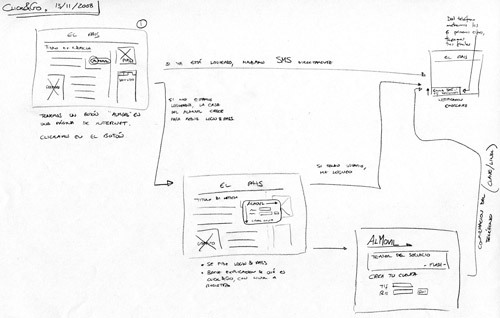 Some screens in the flow required extra detail, so I created wireframes for them. These that were considered critical were turned into electronic documents (with Balsamiq), so that changes would be easier to add and maintain. Kept close communication with Visual Design and Development teams to minimise documentation and optimise implementation. Conducted usability tests on the prototype, analysed the results, and created a list of needed modifications. These modifications were distributed as annotated screen captures. Lots of freedom in defining the details of the service had me evaluating and selecting the best tools and activities for the job. Responsibility, including a stake in project-managing. End-to-end experience in service design, from turning a general idea into a concrete solution and then testing and refining it. Even though Amimovil never took off commercially, Project Management was impressed with my performance. I was called as a consultant in several other projects involving Movistar as a result.